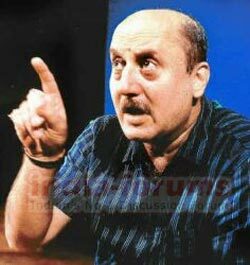 Mumbai, Aug 12 (IANS) Anupam Kher will soon be making a film based on events in his own life, and acting in it too. The actor-producer's new protege, Neeraj Pandey, who's scripting Anupam's second directorial venture 'Dosti Badi Cheez Hai', will direct the film on the actor's eventful journey from Shimla to Bollywood with Anupam in the lead. This would be a rare Indian film where the protagonist would star in his own story. 'It won't be so difficult for Neeraj to direct a film on my life,' Anupam told IANS. He will be seen as a dead man in Rahul Rawail's comedy 'Buddha Mar Gaya'. There's just one hitch. The title 'Kuch Bhi Ho Sakta Hai' has been registered by playwright Feroz Abbas Khan as his legal property. Interestingly Anupam won't be the first actor to make a one-character film on his life. In 1964, Sunil Dutt made the ultra-experimental 'Yaadein' based on his own marriage to Nargis. Would Anupam's autobiographical film have other characters, or would it be a one-character vehicle like the play? 'It will be as true to my life as the play, even if we change the title,' says Anupam.